I might be well beyond my “school age years” but let me tell you, that doesn’t stop me from stocking up on all the colorful school supplies! Technically I can say they’re for my toddler, right? Right! Does anyone else walk up and down the “back to school” aisle with glee? 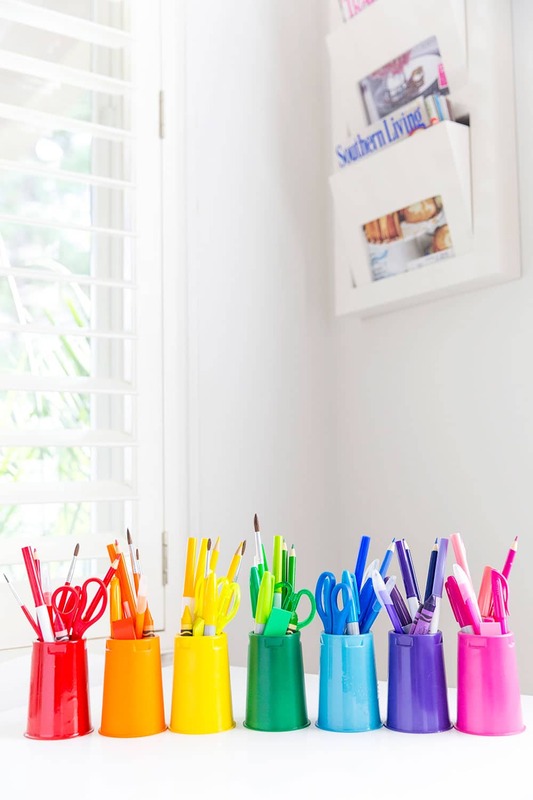 So I recently came up with a creative way to keep them all color coordinated and you won’t believe what I used…. Yoplait Cups! Stock up friends (the lemon is my favorite because I like to make lemon frozen yogurt). 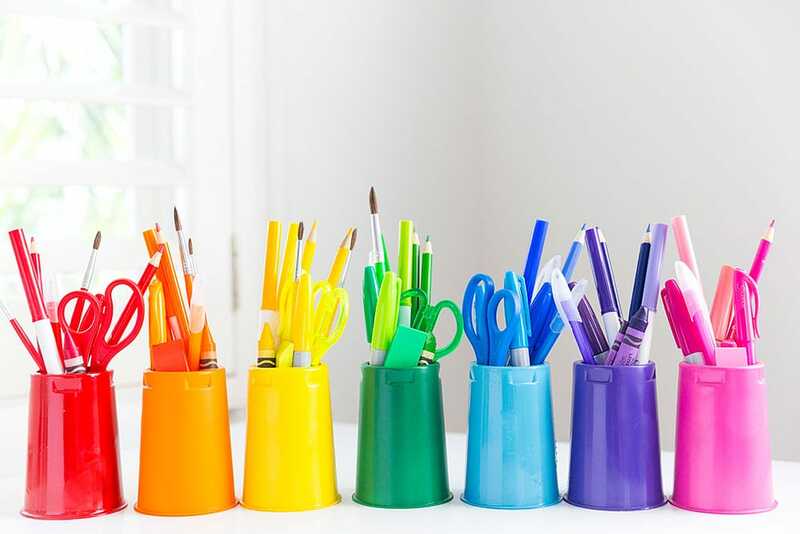 After you’ve enjoyed your treat, this colorful back to school DIY can get started! We have ours displayed by my daughter’s little “mini table and chairs” in her playroom. It’s helped her learn all her colors! Plus, it makes clean up easier because she can easily identify where each item should go based on color. Anything I can do to help a two year old learn how to “clean up” is a win by me. Plus, she loves the yogurt, and being that Yoplait Original has 6 grams of protein, they help keep her fueled all day long! This is also a great idea for teachers to make for their classrooms (or art rooms, Sunday School classes, daycares, birthday parties, etc). Rinse Yoplait Original cups and allow to dry. 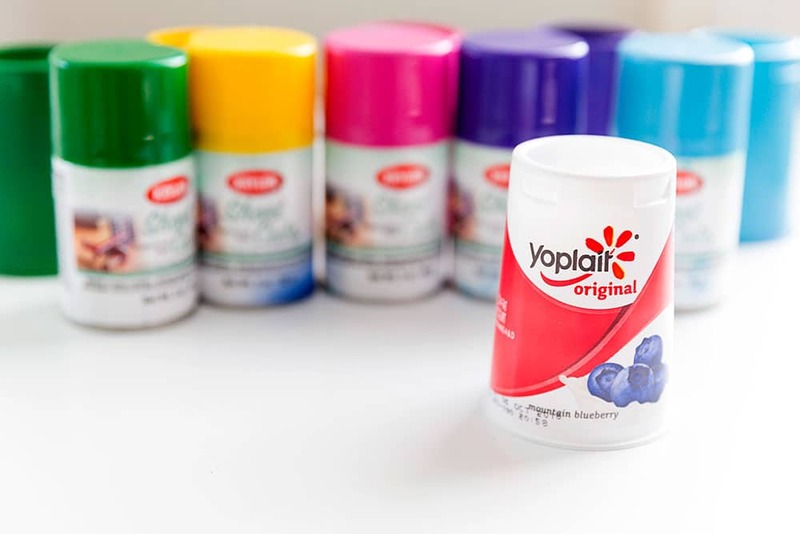 Using a variety of rainbow colors, spray your Yoplait cups. It’s best to spray thin coats and allow to dry between each coat. I gave mine about 2-3 coats. Allow the cups to fully dry. 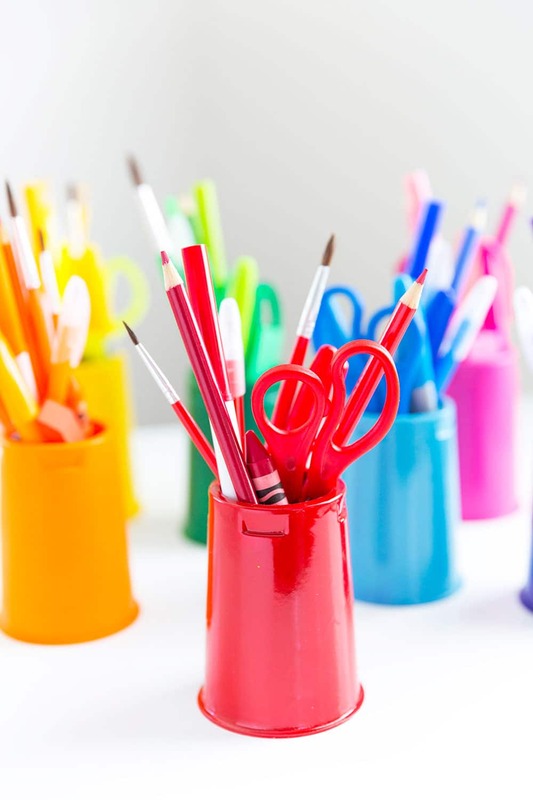 Separate a variety of school supplies (colored pencils, markers, crayons, highlighters, erases, paint brushes, etc.) into the color coordinated cup! If you don’t use spray paint a lot, here’s a tip: look for “mini” size spray paints at craft stores that are the perfect size for small projects like this one! 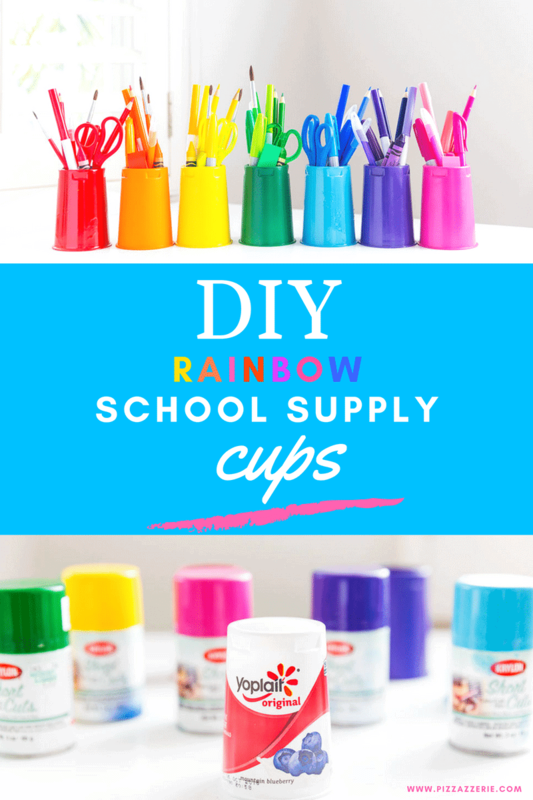 I’m already thinking of more ways to use these cute painted cups. All gold with succulents for a party favor? All white with a monogram on the front? Yes and yes! So many ideas! It’s that easy! 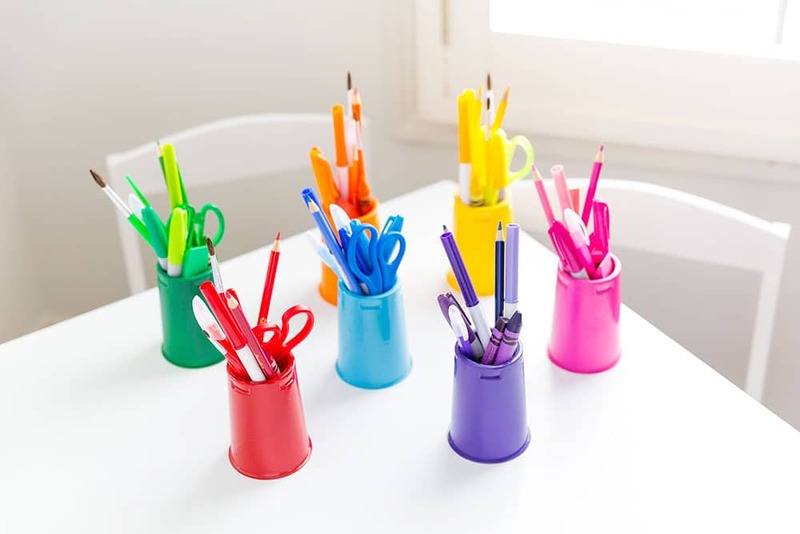 Remember to get the iconic Yoplait cup shape so it’s tall enough to hold all your colorful school supplies. You can find their full product list here. Speaking of all the flavors and varieties…. Try all of Yoplait’s 100+ flavors for a chance to win $100,000! Simply enter the code on top of specially marked lids at yoplait.com/100ways and you could win one of more than 3,000 prizes. * Hooray! Thank to our sponsor Yoplait for allowing us to share this post!